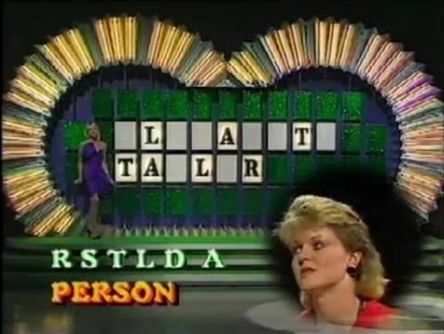 Game Show Memories – Wheel Of Fortune. The game that could be seen as glamorised Hangman that was based on an American format. 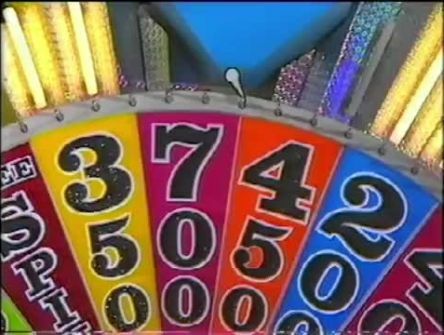 The basic idea of the show was to spin the wheel to solve puzzles and win prizes. 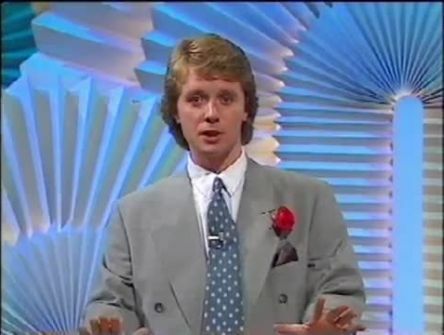 The original hosts were Nicky Campbell (taking a day off from Top Of The Pops) and Angela Ekaette who turns the letters round on the board, although she didn’t last long and was quickly replaced by the more familiar Carol Smillie. Three contestants took part. The category of the puzzle that they have to solve is revealed and then they answer a general knowledge question to gain control of the wheel. 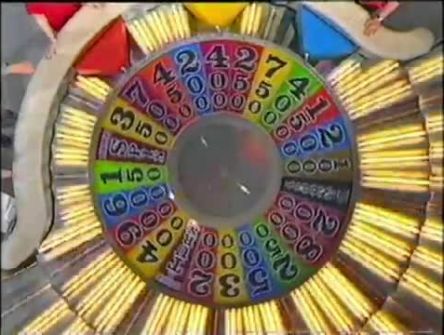 They then spin the wheel which has various points values from 150 to 1000 on it plus other segments including free spin, lose a turn and star prize. They had to avoid the bankrupt segment though or they’d lose all their points that they accumulated in that round. They then pick a consonant that they think is in the puzzle. For every one there they win the points equivalent, so for example if they land on 200 and pick the letter “R” and there are two of that letter in the puzzle they win 400 points and they can have another spin. If they pick a letter that isn’t there they lose their turn. This carries on until there are only vowels left in the puzzle or they think they can solve the puzzle with the letters that have already been revealed. If they are stuck though they can buy a vowel, with each one in the puzzle costing them 250 points. Whoever solves the puzzle successfully then has the chance to pick a prize as announced by Steve Hamilton. This carries on for a few rounds with additional 1000 and bankrupt segments being added to the wheel and the points being doubled in later rounds until time is up and then the highest scoring contestant goes through to the final, with the losers receiving consolation prizes. What they played for in the final varied throughout the years, sometimes it was a cash prize, and in some years they could choose if they wanted to play for money or a car. In the final the contestant is shown the category and then picks five consonants and one vowel. They then have 15 seconds to solve the puzzle. If they do they win the prize. As restrictions were relaxed on how much money could be given away on game shows the star prize value increased throughout the series. The hosts changed a lot throughout the years. Bradley Walsh became the main host in 1997 and he had a bonus prize feature called “Brad’s Box”. He was assisted by the new co-host Jenny Powell. In 1998 he was replaced by John Leslie and the bonus was renamed ‘Leslie’s Luxury”. In 1999 the show was relegated to daytime, a fate that long-runners Catchphrase and Family Fortunes would also suffer, which meant that the prizes on offer were now of a smaller value, although this did also mean that it was now shown every weekday instead of just weekly. In 2001 there would be another new presenting duo who were Paul Hendy and Terri Seymour and the studio was given a new design but after 13 years this turned out to be the final series. Wheel Of Fortune is a show that is something of an institution in America and it is still running there, but it now hasn’t been shown in the UK since 2001, although some series have been repeated on Challenge in more recent years. At the height of the show’s popularity in this country there were a few celebrity specials made and there was also some merchandise released including a board game although unfortunately I never had it myself, but this was always a show that I enjoyed watching. Maybe it’s about time for a revival. 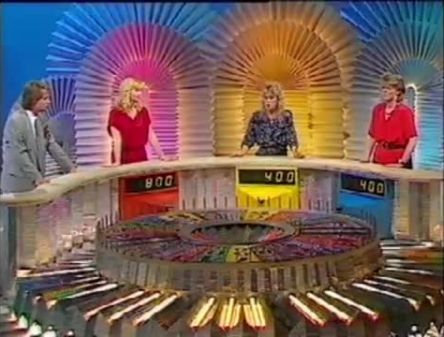 Bring back a revamped wheel of fortune with the host Nicky and public to choose host,s assistant. Would Nicky want to do it though? In any case, the job would be more likely to go to Stephen Mulhern or Vernon Kay. And Peter Dickson would almost certainly get the voiceover role. great site and brings back great memories. Thank goodness Angela Ekaette only lasted 1 series. Why did she have to walk and stand looking like a teapot? She also talked too much. Her job was to turn the letters around not to ‘big herself up’.